Vaseline is a girl’s BFF (and my secret weapon!) when it comes to all things beauty. Not only is it the ultimate multi-use product, it's super affordable too. 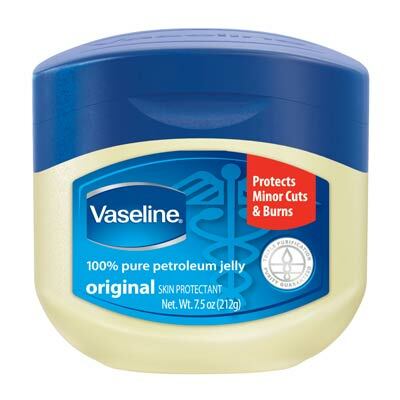 Here, six surprising ways to work petroleum jelly into your get-gorgeous routine. Brush on a thin layer using a brow groomer to comb and set hairs into place. Apply a thin layer to eyelids before brushing on shadow so makeup stays put all day. Also try mixing petroleum jelly with eye shadow pigments to create a long-lasting, cream-based product. Simply, dab on fingernails before bed. Bonus: it instantly revitalizes a dull mani. Mix the new Vaseline Petroleum Jelly Cocoa Butter with sea salt to create a body buffing scrub that smells great and leaves skin flake-free and refreshed. Apply a little to tame pesky fly-aways or rub it into tips to add shine and hide the appearance of split ends. Protect yourself from cold air and wind by lathering on petroleum jelly, which creates as thin, non-greasy, protective layer to prevent dryness and guard against moisture loss. It also helps heal dry, cracked skin, cold sores, and blisters too.